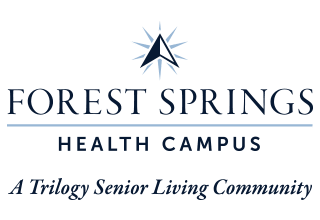 Forest Springs Health Campus is a senior living community in Louisville, KY, where opportunity is a part of the everyday. We’re not just health service providers. We’re motivators, fun seekers, passion drivers, and lifelong learners. Life at Forest Springs Health Campus is more than fulfilling – it’s inspiring. That’s because we build communities that answer to residents’ wants and needs. Seek out the Life Enrichment programs that interest you most, whether you love thoughtful activities or you’re someone who lives to be hands on. Catch up with family and friends over a restaurant-style meal in our community dining room, or take them around our lovely grounds. At Forest Springs Health Campus, you can live a life filled with the things you love. We built Forest Springs Health Campus on a foundation of family values: compassion, honesty, respect, and above all, service to others. For over 20 years, we’ve been connecting with people across the Midwest who share these values. Many of them have become Trilogy employees, and many more have become valued residents. We take pride in treating all of them like family. When you choose a Trilogy Senior Living Community, you can count on us to serve you according to our values, and to uphold those values with standards you can depend on. That’s The Trilogy Difference. You’ll feel it the moment you walk through our doors, and you’ll see it everywhere you look. It’s what makes every Trilogy Senior Living community a choice you can be proud of.